One of the most common questions that I am asked concerning dogs is how much to feed them. While this seems like a very straightforward question, there are actually some unique circumstances that make this question very difficult to answer. 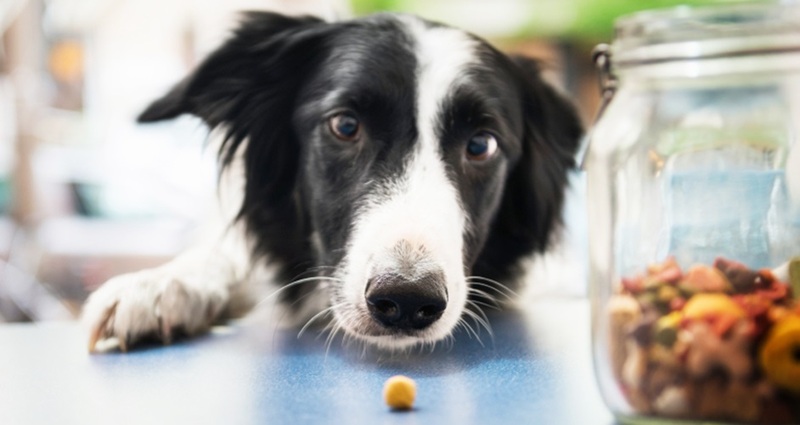 This article will help to explain those circumstances and will help pet owners choose the right amount of food for their dog. I once had an elderly client that bred and raised Labrador Retrievers. Whenever she brought her dogs in to the clinic I was consistently impressed with the fact that they were always about the perfect weight with beautiful coats and good muscle tone. Finally, one day I asked her what her secret was that allowed her to feed her dogs in such a way that they were always the perfect weight. She thought for a few seconds and then leaned forward and in a serious whisper divulged, "when they are skinny I feed 'em more and when they get fat I feed 'em less." Years and hundreds of nutritional consultations later, I am still impressed with the simplistic truth of that statement. Despite our determined efforts to devise a 'one size fits all formula' that will tell us exactly how much to feed a dog of a given weight, we still do not have one, and it is very unlikely that we ever will. What that owner displayed was years of experience that allowed her to make slight adjustments in the dogs' diets to keep them at the perfect weight. Unfortunately, most owners do not have years of experience and hundreds of dogs under their care to allow them to become good at regulating their dogs' caloric intake. Yet, maintaining the proper weight is critical to ensuring good health in your dog. Underweight dogs often suffer from poor muscle tone, delayed healing, loss of energy, and metabolic and reproductive disorders. Overweight dogs, which are much more common, suffer from arthritic problems, an increase incidence of metabolic disease including diabetes and liver problems, as well as a lack of energy, and an increase in skin problems. They may also have a shortened life expectancy. The health benefits from providing proper nutrition in the correct amount are immeasurable. There is one readily available source of information concerning feeding amounts. Every bag of food has a suggested feeding guideline based on the weight of the dog. But there are several problems with these guidelines. First, there is usually a wide range of recommended quantities to be fed. Second, determining a quantity to be fed based on weight is an extremely inaccurate way of feeding. Third, there is little consistency between brands in the recommended quantities to be fed. For example, I did a quick survey of the labels of three of the most popular brands of dog food. They were all adult maintenance formulas with fairly similar ingredients, levels of fats, proteins, fiber, etc. All three labels had different recommendations on the total daily amount to be fed. One recommended 1(and3/4) cups, the second recommended 2 cups, and the third stated 2(and3/4) cups. This is a discrepancy of over 50% in recommended feeding amounts between three of the most similar types of dog food. What happens when you take into account puppy, senior, performance, and low fat foods? It is little wonder consumers are confused on this issue. The point is that the amount on the back of the bag is rarely the amount that should be fed, but should be considered a rough starting point. The first step in understanding your dog's energy requirements is realizing that there is no set formula for determining your dog's individual needs. For people, it is fairly simple to calculate your recommended daily caloric requirements based upon your weight because, as people, we are all relatively similar compared to dogs. As a person, if you want to know how many daily calories you should consume all you have to do is look on a chart and there it is, give or take a few percentages for activity level and age. But with dogs, there are huge differences between breeds, size, growth rates in puppies, activity levels, skin and coat thicknesses, and living conditions. For example, compare the energy needs of a young Malamute living outdoors and learning to pull a dog sled to that of an adult Pomeranian living in a heated apartment, and the pound for pound difference in caloric needs could be over tenfold. Those kind of differences rarely happen in humans and these differences are why it is so difficult to have a set answer for how much a dog should be fed. So where should you start? The first place to start is with the food itself. Feeding a poor quality food is never a good idea because in addition to actually being more expensive because of the increased quantities needed to fulfill nutritional requirements, it also produces more waste. It is also more likely to create digestive or behavioral problems. So, to begin, choose a high quality food and look at the recommendations on the label to get your starting point. From there you need to have an accurate weight of the dog and a projected target weight, whether it is an adult on a diet or a growing puppy. Ask your veterinarian's opinion on what your dog's ideal weight should be and factor that into your feeding amount. Remember that most dogs are overfed and underexercised so, if in doubt, I usually tell people to feed a little less. After you have started feeding the amount that you have calculated that your dog needs, then you need to weigh your dog at least monthly to determine if the amount fed is appropriate. If necessary, increase or decrease the amount of food slightly until the dog stays at his ideal weight. A handy trick for weighing your dog on a bathroom scale is to weigh yourself while you hold the dog and then weigh yourself without the dog and subtract the difference. As you can observe from the table above, the amount of food that you feed your dog will change throughout your dog's life. Most weight problems develop slowly and will often begin when a dog goes through the transition from a growing puppy to an adult. The adult dog's appetite is often greater than his need. Another time during a dog's life at which weight gain occurs is when an adult dog becomes a senior and his activity level decreases. By being aware of the need to adjust your dog's calories and performing periodic weight checks, you can avoid overfeeding during these problematic transition times. Knowing how much food to feed your dog can be a confusing problem. Start out with a quality food, note the feeding recommendations on the bag, add or decrease the amount fed depending on your dog's activity level and housing environment, and then start feeding that amount. From there, by carefully monitoring the dog's weight and making adjustments as needed, you can keep your dog at his perfect and healthiest possible weight.